If you arrive in New Zealand by air, chances are you will fly into Auckland. It is a hub of connectivity to everywhere else in New Zealand. As the largest city in New Zealand, it offers a cosmopolitan feel before you begin adventuring along the many coasts, mountains, and smaller towns that New Zealand has to offer. Most travelers only stay for two or three days, unless they are on a work-holiday visa. The jewels of the city are really the suburbs, so I suggest getting off Queen St. and heading to a quaint suburb for a more pleasurable stay, however brief it may be. 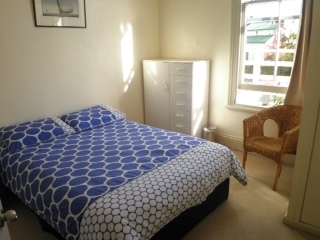 If you are looking for a quiet and safe hostel in a chic neighborhood look no further than Ponsonby Backpacker Hostel. 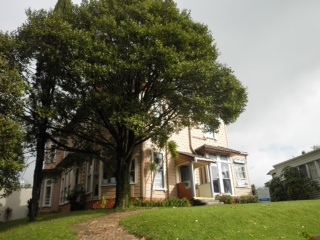 This hostel is a converted 19th century home, tucked right off the main drag of Ponsonby Road, lined with chic restaurants and hip clothing stores on a picturesque suburban street. The hostel sleeps 40, and has a small intimate feel. Although it is a 20-30 minute walk to the harbor, you can easily jump on a bus for $1.90 or enjoy one of the various routes into the city. Considering the ease of getting to this hostel from the main transportation hub Britomart, it is well worth the ten minute bus ride to experience this cute little area. I suggest walking via Karangahape Rd, a colorful area with ethnic restaurants, second hand shops, and a multicultural flair. A left turn at Queen Street leads right down to the wharf. Also worth checking out is the free Art Gallery Toi o Tamaki. This is a refreshing view on art from New Zealand artists, as well as artistic works about New Zealand. The displays are edgy and fresh, with new exhibits always passing through. For local culture don’t miss the Auckland Museum in Domain Park. It is a $10 donation at the time of writing this. This is a great introduction to New Zealand and Maori culture, history and geography. Ponsonby Backpackers hostel is managed by two young travelers, Jono and Holly, with an Eco-conscience. There is a noticeable effort to encourage lodgers to recycle, conserve electricity, and compost (during the summer months). There is also a rather large herb garden in the back yard brimming with fragrant herbs, among them rosemary, oregano, mint and sage. Travelers are welcome to use them. There is one communal kitchen for all guests as well as indoor and outdoor dinning areas. During the warm months they have BBQs in the back yard. I was there during the low season or winter, May-July. The hostel had a quieter feel, with a few more long term boarders than summer time. It was interesting to chat with travelers on a work-holiday visa because I got a fresh perspective into the work force and job opportunities in New Zealand. During evenings you could easily join communal movie viewing in the tv room, which was a center for socializing. This hostel is geared towards backpackers and adult travelers. Families with children under 18 should consider more of a budget hotel or motel. 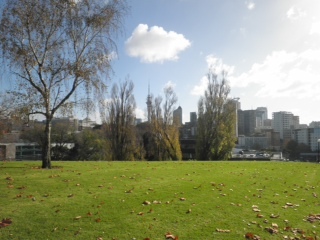 Ponsonby Backpackers also offers several tours of the Auckland area and they can assist with booking. It is helpful especially since the Ponsonby staff have actually sampled the tours and can give you first-hand advice. The top choices are sea kayaking, boating excursions and the Sky Tower of Auckland. Wifi is available for a fee, charged by MB 50 for $5, or about an hours use. There is one communal computer to use, although almost everyone had a laptop or iPhone. Facilities include coin operated washer/dryer. Hostel also offers pickup/drop off from airport. There are six restrooms and six showers. Showers are small but clean. *Rates: These are the winter rates, summer rates are usually $1-2 more. *rates are $2-3 cheaper if you are a member of BBH, the hostel association for New Zealand which might be worth it if you are staying in numerous hostels.